Another apparent terror attack in London today. 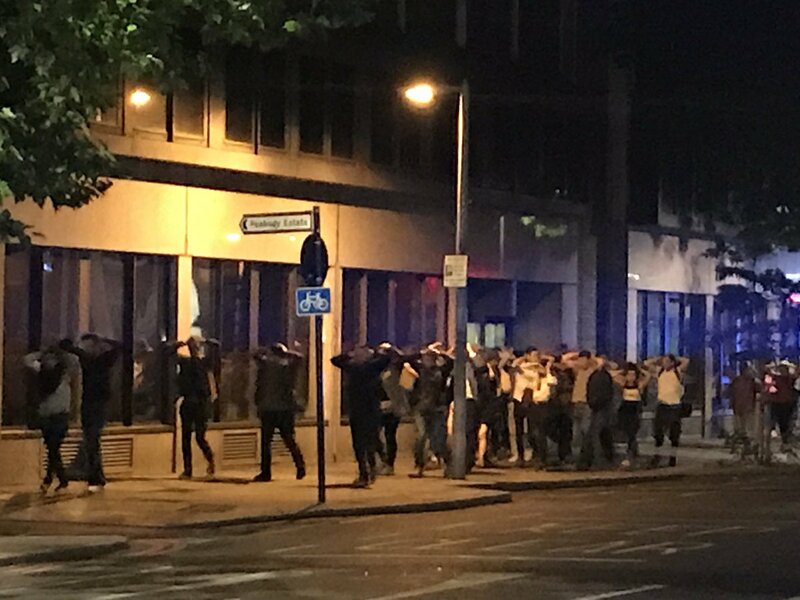 Metro police have confirmed that there was also an incident at Borough Market as well. Another video of a bar in London. Reports of at least two fatalities. To recap at least three incidences have occurred in Central London today. Some fatalities, many injuries. Royal National Lifeboat Institute boats Marine 2 and Marine 3 are part of the response to the London Bridge Terror Attack. 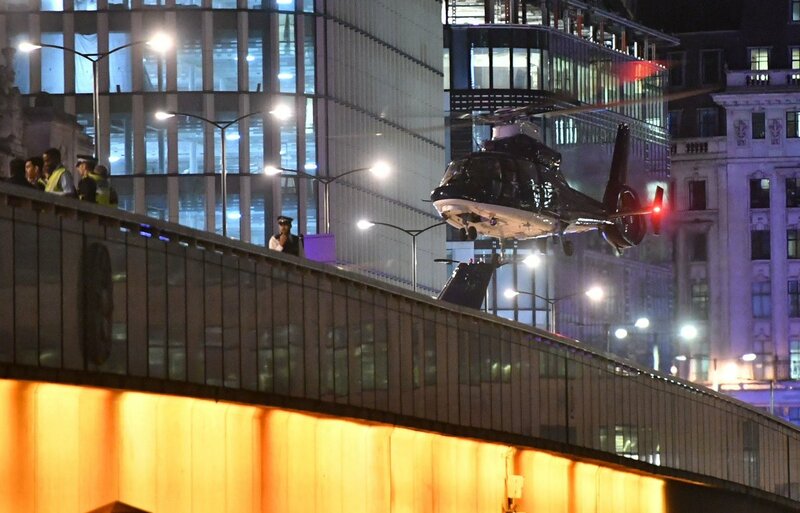 The incident at Vauxhall is unrelated to the London Bridge and Borough Market. The public is being urged not to upload images to social media. An unconfirmed report of another incident at Shard. Gunfire and suicide bombing at two sites in Tehran including the Majlis (Parliament) building. Suicide bombing is overwhelmingly a Sunni thing, not a Shia thing. Iran is a Shia state. ISIS is claiming responsibility (which is fast compared to the European attacks). It's over now, but this happened in Tehran yesterday. Gunmen stormed two major sites in Iran’s capital Wednesday, killing at least 12 people in gunfire and suicide blasts in parliament and at the revered tomb of the nation’s Islamic revolutionary leader. Six aircraft were diverted to other airports. air traffic was affected for several hours as a result of the incident. "There was no real situation of danger, Cologne police said in a statement." One person was killed, and several injured, when a van drove into pedestrians near Finsbury Park Mosque, north London, in the early hours of Monday morning. say one man was pronounced dead at scene. Eight people have been taken to three hospitals. The driver of the van, a 48-year-old man, was found at the scene being held by members of the public and was then arrested. BBC is slow to put out any information on the identity of attackers before they are pretty sure. So if they are putting out eyewitnesses stating that it was anti-Muslim violence it probably was that as opposed to disgruntled or rival mosque member. in Paris a car slammed on a police car. Not quite a multiple homicide, fortunately, but it may as well go here. A man tried to detonate a bomb in a Brussels train station which thankfully did not hurt anyone. Perhaps malfunctioned since it had two different detonations from the same device. He moved away from the blast site and charged a Belgian soldier responding to the incident while sounding off with a hearty "Aloha Snackbar!" The soldier shot the man, concerned he might have another device. Prosecutors say the man did it in the name of ISIS. Kudos to the soldier for getting on the trigger early and often. Van plows into Barcelona crowd: Many dead and injured. Possible gunman. Update: two armed men entered a restrauant. 19 dead, over 100 injured. Isis claims Barcelona attackers are soldiers of the Islamic State but has not explicitly claimed responsibility. Can't get a decent link yet, but it popped up on my phone. Senior police official: Barcelona van attack linked to explosion previous day in which 1 person was killed. One suspected terrorist identified as Driss Oukabir. A Moroccan with Spanish Passport. Spain -- Driss Oukabir, originally from Marseilles in France and has been living in the Catalan city of Girona. Was one of the three terrorists." That's because they arrested two, a Moroccan and a man from Spain's north African enclave of Melilla. Two of them had the same name? In the end five perpetrators were caught/killed. A just happened evetn. The finnish police shot and killed a man that attacked others by knife. Is it because you're in the EU that you can't say a "Muslim Man"? He was heard shouting Aloha Snackbar when he went on his stabbing spree. This is what some members if the Finnish community are saying..
well, from my side, I just was hasty to report. Moussa Oukabir, thought to be 17, was a Spanish citizen from the northern Catalan city of Girona. Most of the other suspects were Moroccan.Oukabir's brother Driss was one of them. He reportedly turned himself in, telling police he was not involved and that his documents had been stolen. He is 18. So we have 4 Moroccans out of 4! Cos yesterday I Moroccan woman with (Notice) Belgian citizenship was arrested in Greece as soon as she landed, after guidance of the Italian port authorities. there was an international warrant on her for being involved in terrorism. Fox news reports that a Barcelona terror suspect has been freed by a judge. - sword wielding man assaults policemen in London outside of the palace. He got arrested. - in Indionesia 5 people we arrested in western Java, a refuge of Islamic militants. Materilas for a DIRTY BOMB were found in their apartment.